Wanting to take advantage of social media to improve their relationship-building efforts with customers, Bill Lashovitz, owner and president of RBA Homes in Red Bank, New Jersey, turned to the New Jersey Small Business Development Center at Brookdale for assistance. His timing was perfect, as the training and counseling delivered by the NJSBDC at Brookdale to Bill and his RBA management team coincided with the federal Small Business Jobs Act grant. A New Jersey registered homebuilder, RBA Homes’ President chose to specialize in modular home construction, both as a builder and developer. The company, started in June 1986, represents numerous top quality modular home manufacturers and emphasizes custom designed floor plans, quality craftsmanship, full service and dependability. Over the years RBA Homes has become New Jersey’s leading custom modular homebuilder using modular technology in hundreds of homes throughout Monmouth, Mercer and Ocean counties. “We believe that modular construction can provide a quality built product at an affordable price, in less time than a traditionally built home,” says owner and President Bill Lashovitz. However, the Company can also offer the option to build a custom home using traditional on-site framing, which can provide more flexibility for larger-scale projects or for more elaborate designs. NJSBDC professionals began providing customized business training using valuable social media education and instruction to RBA Homes’ employees in September 2012. The customized training at Brookdale specifically targeted the company’s business operations and values while helping the RBA workforce to implement effective social media practices and marketing strategies that would ensure the company’s future growth. The training allowed for the organization to continuously improve upon the level of service they provide their customers. 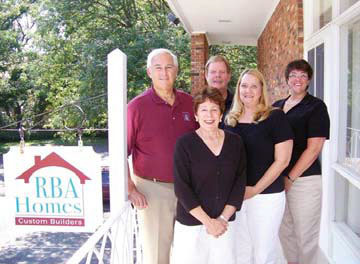 Like so many other businesses in Monmouth and Ocean counties, RBA Homes was impacted by Super Storm Sandy. However, due to the specialized training company employees received, RBA maintained a strong presence in the construction industry. The company has increased the number of employees from 8 employees to 13 employees and its sales revenues have increased by more than 100 percent reaching $6 million dollars-plus.